This web site has the entries made by J.W. Lynch in his personal journal during the years of 1898 to 1925. During these years he worked at the Elizabeth, PA. Marine Ways. His journal details the day to day activities at the Ways, specifically he names men he worked with and the boats that were being repaired or built and if the boat was being repaired, he lists the repairs that were completed. Each page of the journal is shown as written. I have scanned each page and placed it on this web site as a JPEG file. I have also typed each journal page which helps each of the individual journal pages load faster and also makes it easy to search for specific information. Names of people, boats, or any word can be entered into the search engine, located on the Home Page or Name Directory Page of this web site, the search engine will give you each page that your word occurs on. I have attempted to remain true to JW's writing by copying most words as written. JW continued to record his daily activities after his retirement from the Marine Ways in 1925 as he made entries into 1948. He included the names of numerous citizens of the Elizabeth, PA area in his journal. He wrote in his journal during March 1925 the following: "The Deaths of People I have known well or have been around and with through my life follows at intervals in this Diary" I have included the names of these individuals on the page titled "Name Directory." You can use the Search function on the Home Page or Name Directory Page to see if your ancestor is named. If you would like to see a specific date from 1898 to 1948, please email me and I will respond to your request. I look forward to any comments or questions you may have on the contents of this web site. jwmohney "at" comcast dot net Please make changes to email address, it is not a clickable address. A special thank-you and recognition goes to Gary Imwalle, a Riverbuff from the Cincinnati, Ohio area. Gary read every page of my Great -Grandfathers journals and proof read most pages of my web site. He used his extensive Riverboat building knowledge and his attention to detail to insure I correctly utilized,spelled, and typed the many boat building terms used by JW in his journal. Gary also spent many hours researching and answering questions from me relating to Riverboats. I thank Gary for his efforts using his experience and knowledge of Riverboats to help insure the information on this web site is as accurate as possible. The above Thank You to Gary Imwalle was written during 2004. Gary passed away on March 15, 2008. I miss his advice. Below is an example of the type of information you will find in the journal. 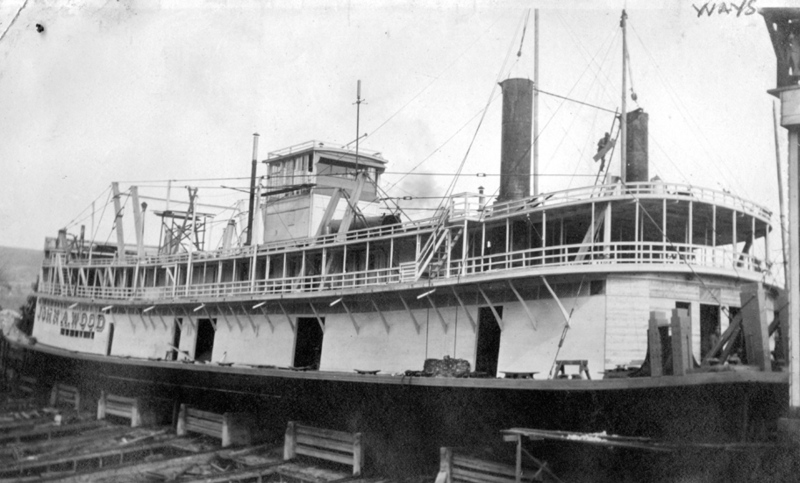 Shown is the Steamer John A. Wood under reconstruction during 1919 and the journal entry concerning this activity.